We may never again know the Prairies as they once were: vast, living carpets of green and gold, speckled with wildflowers, inhabited by millions of birds and beasts, punctuated by countless potholes and slow-moving streams that meandered across the land. Prairie wetlands and streams still provide food and shelter for one of the most diverse communities of wildlife on the planet. Deer use shoreline shrubs as cover, waterfowl nest in upland grasses, weasels hunt along the edges of water bodies, and flycatchers streak above cattails in pursuit of wetland insects. But vast stretches of native grasslands have vanished under the farmer’s plow or developer’s bulldozer, along with two-thirds of potholes. Many prairie streams have been straightened to prevent floods or to irrigate crops. And cattle have destroyed shorelines by grazing vegetation to the ground, trampling banks, and fouling water with their waste. The following projects will help you protect wetlands and streams on prairies and in other rural areas. Most farmers and ranchers know the value of healthy shorelines and clean water, not only for wildlife but also for cows and crops. But often a wetland or stream is the sole source of water for livestock, and growing crops to the water’s edge is more profitable, in the short run, than planting a buffer strip. Promote the coexistence of wildlife and agriculture. Start a rural awareness campaign to keep shoreline health in people’s minds, while ensuring sustainable agriculture. Persuade landowners to set aside wetlands and streams as protected wildlife habitat. Most waterfowl breed on private farmland, and many migratory birds could not survive without rural wetlands as stopover sites. Promote cropland conservation techniques that help farmers protect naturally vegetated banks, preventing the run-off of fertilizers and pesticides into water bodies and minimizing damage to wildlife habitat. Urge ranchers to fence off fragile wetlands and watercourses to exclude cattle or allow only limited access to shorelines. Enhance the habitat value of fences by turning them into living fence rows. Inform ranchers about alternative water-delivery systems, like wind-, stream-, and solar-powered pumps, which enable cattle to stay on dry land. Recommend alternative grazing sites on higher ground away from shorelines. Volunteer to help farmers and ranchers plant shoreline buffer strips at least 10 m wide to prevent bank erosion and to protect water bodies from agricultural run-off. Fence rows usually evolve over many years, as trees, shrubs, wildflowers, and herbaceous plants grow freely alongside shoreline fences. They attract natural enemies of agricultural pests. They act as windbreaks, reducing erosion and the loss of moisture from the earth, while protecting water quality, providing nesting cover, and serving as wildlife corridors. Speed up the establishment of one of these diverse communities by growing scattered vines and trees, bordered by shrubs, then wildflowers and grasses, along a sunny shoreline fence. For every hectare of wetland on a prairie farm, at least one or two hectares of grassy cover are crucial for ground-nesting species like bobolinks, pheasants, meadowlarks, and mallards. This permanent cover also keeps agricultural run-off from polluting potholes and marshes. Native upland grasses, including Canada wild rye, switchgrass, Indian grass, and big and little bluestem, provide year-round cover and superior nesting and foraging habitat for wildlife. Your school can conserve upland nesting cover by planting a combination of native grasses around a prairie wetland. The wood duck has bounced back from near extinction since the early days of this century. Overhunting and a shortage of nesting cavities once caused its population to plunge, but hunting regulations, together with the building of artificial nesting structures, have helped make this waterfowl one of our most abundant ducks. Build a nesting structure out of cedar, with the roof sloping downward and overlapping at the front and back to shed rain. 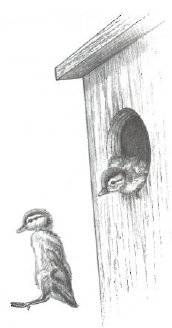 The depth of the box should be 60 cm; the floor 30 x 30 cm; the entrance hole oval and 46 cm above the floor, 8 cm high x 10 cm wide for wood ducks and hooded mergansers, 10 x 13 cm for common mergansers, and 9 x 12 cm for common and Barrow’s goldeneyes. Attach an 8-cm-wide strip of wire mesh on the inside front panel of the structure to enable ducklings to climb to the entrance hole and jump out. Line the inside with cedar shavings to a depth of 10 cm. Mount the box on an isolated tree (3 to 6 m high) facing the water’s edge or on a post 1.2 to 1.8 m above water, with no obstructions near the entrance hole. To prevent predation by raccoons, install a baffle or aluminum sheet around the base of the tree-trunk or pole. Angle the structure slightly forward to make it easier for ducklings to climb out. 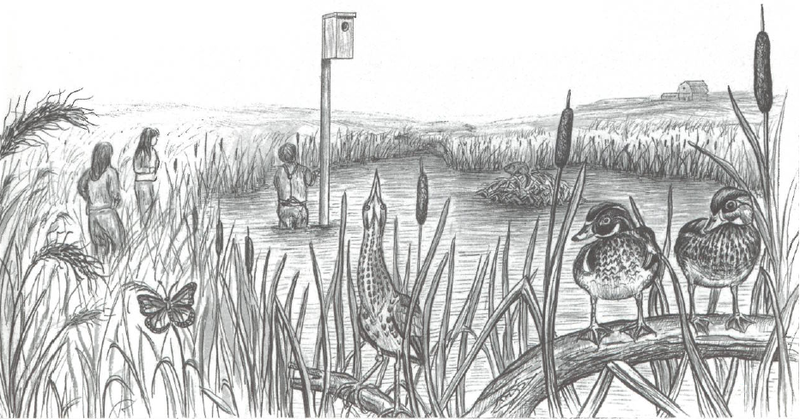 As a rule, install two nesting boxes per hectare of wetland. Inspect, clean out, and line the box with fresh wood shavings each fall.